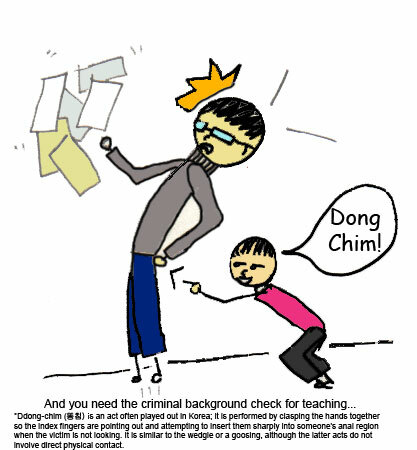 My little cute wonderful kindergartener's introduced me to a little game called 'dong chim'. If you have lived in Korea, you are probably laughing by now. For all others reading, by the time you finish this post you will be glad your introduction to 'dong-chim' was via a blog post and not real life. Back to the game. This cute little kid Justin, also my naughty kid, introduced me to 'dong-chim'. Although I love him to pieces, don't be fooled by his cuteness. The desks and chairs in my classroom were low to the ground so they would be suited for the kindys. Low to the ground means lots of bending over, squatting, etc. Well, one day I went to help another student and all of the sudden I felt a big fat poke up my rear! I was in denial and thought 'no way!' ... but yes way! It totally happened, Justin did the 'dong chim' to his nice teacher from Kansas. I turned around with the 'Who did that?' and 'What just happened?" expression but my kindys had no reaction. They acted like it was some normal phenomenon to violate your teacher. I gave Justin the 'don't ever do that again' talk ... which must have been a joke to him because while we were buckling up all the kids on the bus for a field trip - BAM, I got 'dong chim'ed' for the second time. Let me just say that Korea is way more lenient with their disciplining rules and Justin got his hands swatted a couple times. I'm proud to say he never did it to me again. But then we have Lisa ... she surprised another teacher with the 'dong chim' game and so it lived on. This picture is not entirely correct because it DOES involve physical contact! I assure you. I have no idea how that game got started or more so who would teach that to a 4 year old but it is funny to look back on the experience and it sure makes for a funny story to tell people back home. For more expat stories click on the link below.